Bostonians just rang in the New Year with their annual celebration known as First Night. It's been a persistent tradition for 34 years, regardless of the ups and down in the economy, post-9/11 concerns about public safety, fears about Y2K, and a host of variable weather conditions. The First Night concept began here in Boston in 1976. It was the brainchild of a small group of alternative artists and musicians who envisioned that the public would enjoy doing something other than getting inebriated while viewing a million-plus drunk New Yorker's on television as they celebrated the holiday to the beat of bandleader Guy Lombardo. There had to be more to it than the dropping of an illuminated ball in Time’s Square, or a drunken party with silly paper hats. The new celebration in Boston would embrace the current Zeitgeist and blur the line between performers and the public. It would be avant garde, edgy, and experimental. "People would be encouraged to come in costumes and masks, so that there would be little difference between the observer and the observed." It would also be an opportunity to showcase the work of contemporary artists and musicians working in and around the Boston-metro area. The activities and performances would occur both outside in the open air and be staged within Boston’s churches and public buildings. I even recall store-fronts on Newbury Street being used for performance art. I wasn't present at the meeting, but it is said that Clara Wainwright - a local artist and community organizer - was the instigator of the event organizing committee. It must have been an electrifying meeting, with a myriad of ideas bouncing off the wall in chaotic fashion. Someone apparently wanted to call the happening the “Boston Common Garden Variety Show.” Ultimately, the title "First Night" emerged as events' central mantra. I assume that the original cohort of First Night visionaries included Paul and Zeren Earls of Cambridge. 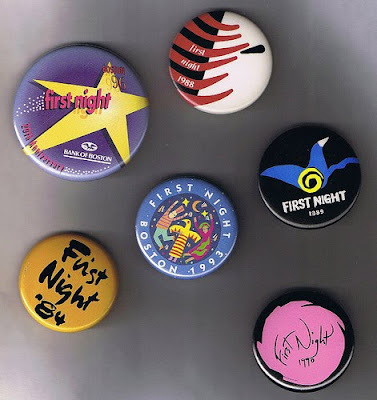 They were definitely involved with First Night from the very beginning. In fact, in 1980 Zeren Earls assumed the chief leadership role of the not-for-profit First Night organization. Under her direction for many years, she brought the annual First Night Celebration to new levels of accomplishment and gained national and international recognition in the process. The annual celebration of community and creativity soon attracted a up to a million participates. For an arts organization - that is huge! It became a model of success and was adopted by other cities - large and small (except of course NYC). First Night was exported internationally by Zeren Earls, but today she lives in the Berkshires and freelances as a travel writer. Her husband, Paul Earls (1934-1998), was known to me. Paul was an electronic music composer who I'd often see amongst the small circle of experimental music enthusiasts and artists I'd hang out with. Paul Earls liked to integrate his music with lasers and experimental visual effects (working closely with Otto Piene). He had a cool gig with the Center for Advanced Visual Studies at MIT and was on the faculty of the Mass. College of Art (where composer Walter Piston had once studied). I'd often walk past his office, a grey non-discript structure on Mass Ave. I'd wonder about what went on in that building. It was an unusual place for a new music composer to hang out. But, the 1970s were interesting times, and multi-media was the up-and-coming artistic playground. 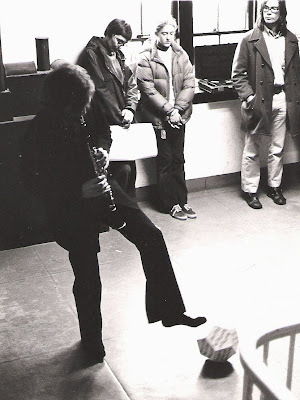 I recall that Paul Earls came to an open house at the Boston School of Electronic Music (BSEM) on Dartmouth Street (founded and headed by Jim Michmerhuizen). It was in 1973. A member of the BSEM faculty, composer/pianist John Duesenberry, would later perform a work for piano and electronics by Paul Earls. I remember Paul as quiet man. He didn't seem to engage in small-talk or smooching. He had a lot of creative ideas running around in his head. Paul Earls started off as a rather traditional composer. His early orchestral work "And on the seventh day..." was recorded in 1958 by his teacher Howard Hanson with the Eastman-Rochester Symphony Orchestra. I believe that this work, which is under seven minutes, is currently the only commercially available recording of Paul Earls. Earls had obtained advanced degrees from the University of Rochester, and in 1970 won a Guggenheim award. But in the 1970s, Earls was writing for soloists, organ, chamber ensembles, vocalists, children's choir, and utilizing video projections, analog-synthesized music, inflatable sculpture, and laser projections. A decade later someone would write that Earl's work "recalled the multimedia meanderings of the 1960's, realized with a quintessentially 80's professionalism." He enjoyed collaborative interaction, working with dancers and actors (such as choreographer Beth Soll). His catalogue of work includes five operas. It was held on April 27th, 1975 throughout the building at the Mass. College of Art (where Paul Earls taught a class). 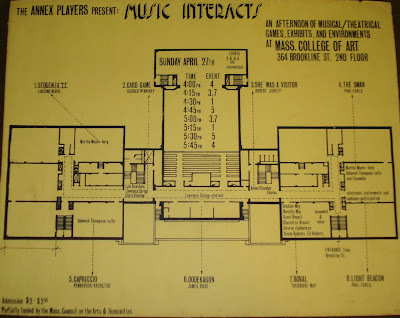 The audience was handed a large yellow floor diagram of the building floor plan upon their entrance and payment of their modest admission fee ($2.50 general, $2.00 for students). The diagram/schedule indicated which pieces would be performed in which room and at what times. The audience was invited to make their own agenda and experience the works at 15-minute intervals in whatever order they preferred. It was a concept and structure that is not unlike what occurs at First Night, albeit on a much larger scale. The Annex Players group was run by Lyle Davidson, Lawrence Scripp, and Chris Yavelow. (The group would later be renamed Dinosaur Annex, and assume different management). Davidson was (and still is) a professor at New England Conservatory (I once audited a class in 16th century counterpoint with him). Scripp is a clarinetist and a professor at Harvard's School of Education working with the famed Howard Gardner. Yavelow is an active composer and web-based multimedia designer now living in the Baltimore-Washington D.C. area. He returned to American soil after a significant career as a composer in Europe that spanned for decades. On the "program" at the Mass. College of Art, Earls had two works: Light Beacon for electronic instruments and audience participation, and The Swan (with harpist Martha Moore and cellist Deborah Thompson). The program also included some mainstream contemporary works by Berio and Penderecki. My piece, DodeKagon (1975), was performed by clarinetist Larry Scripp (shown in the photo above). It was constructed as a 3-dimensional score in the shape of a 12-sided dodecahedron. The performer gently kicks the music around the floor, and which ever side comes up is the side that gets played. It was hybrid of 12-tone and Aleatoric music, with the formal-structure being determined more or less randomly. Of course, it has a theatrical element as well. DodeKagon has been performed several times since then. It was my first (and probably last) work as an installation-artist. The 70s have passed. Been there, done that. But it was fun. I mention this only in passing because the spirit of First Night - at least in its original incarnation - was very similar to this event. You might say the the Annex Players Interactive Multimedia program was a demo, a dry-run, a test kitchen so to speak, or (to use a more contemporary term) an "incubator" for what would later become the much larger city-wide celebration just over seven months later. It's no accident that performance art and new music were the main dish at the very first, First Night festivity on the evening of December 31st, 1975. Of course Paul Earls became a prominent player in the annual First Night events. I believe I heard Richard Pittman's Boston Musica Viva perform a work of Earl's at the old Hynes Convention Center in the first First Night celebration of 1976. It incorporated green-colored lasers. Later on I know that Paul Earls received a First Night commission to compose a work for "all of the carillons in Boston" titled "Jubilee Ring." It was performed at the Y2K version of First Night. I've heard that his son is (or was) a bell-ringer (such as myself), and this may have inspired the composer to choose this unusual medium. I didn't keep in contact with Paul Earls over the years. However, the last big work of his that I heard was his opera about a Colonial Indian uprising entitled "The Death of King Phillip." It's a 50-minute stage work based on the legend of Icarus. It was performed in March of 1976 by the New England Chamber Opera Group (NECOG). [His opera was combined on a double-bill program along with a chamber opera titled "Chocorua" by Robert Selig (1939-1984). "Chocorua" is also based on a Native-American Indian story. Selig was a very talented composer who taught music theory at New England Conservatory. He died at the age of 45, and to my knowledge his music is no longer performed]. That same year Earls' piece "Doppelgänger: Music for Oboes and Laser" was performed by oboist and new music specialist extraordinaire Nora Post. Paul Earls died suddenly in 1998 at the age of 64 from heart failure at MIT. It seems as if his music is rarely performed today. It's a sad state of affairs for a composer, but pretty representative of what's most likely to occur postmortem - even for those who were once famous. Today in 2010, looking back at it all now with hindsight, the artistic vision of experimental media artists (and composers) in 1976 was primitive, but in time would ultimately be realized. Technology has clearly become a dominant force of artistic expression of the late 20th and early 21st centuries. The laser displays of Paul Earls' experimental works are now part of mainstream special effects that we see every at a planetarium show or rock concert. Jeez, I just got an inexpensive pen-sized laser that runs on triple-A batteries to use as pointer for my classroom teaching. What a toy. And today the sound of electronic music is ubiquitous - even the norm. But I can't help by feel that commercial interests have co-opted Boston's big New Year's show. In a odd way, First Night is not as interesting as it was in its initial iteration of 1976. It's become much larger and mainstream in its selection of talent. The current activities seem to be selected with populist sentiments in mind. The blurred line between audience and performer is no longer a guiding principal. Today, people purchase their buttons for $18 a pop, and come to be entertained expecting value for their investment. First Night may be a victim of its' own extraordinary success. Perhaps the truly experimental artists and musicians have gone back underground. I think they may be out there, but lurking somewhere on the Internet just waiting to make their next big move. The forthcoming artistic revolution is incubating. On an high note, let me leave you with a video clip from Icarus - a Sky Opera by Paul Earls and Otto Piene performed in 1982. Notice the high-tech disco ball and giant inflatable dinosaur.